Children are intrinsically curious and creative, growing up in this made up world adulterates these traits. I still remember my childhood days, how we loved playing outdoors and made into toys things that would otherwise be trashed. Not that there was any dearth of toys, but making those things gave us a sense of accomplishment and also taught many other lessons. So, if you ask me, the best way to keep their imagination alive will be to keep them close to nature and to offer them opportunities for lots of open ended play. Skola is one of my favourite toy brands; they have wonderful range of educational toys made from the high quality material which is mostly wood. The toy came in an attractive doodled carton along with detailed description about the toy and how it can be used. 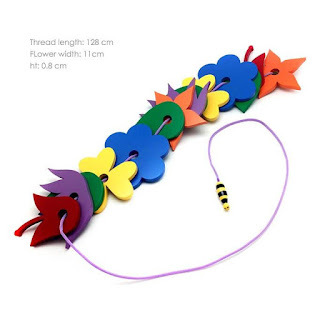 Contents- The toy has 5 pairs of wooden flowers and 4 leaves. The flowers come in different colors. A string with a bee-shaped needle at the end. The package also had a complimentary set of 4 crayons to be used for coloring the box. Quality- There is no doubt that the toy is made up of the best quality material. The colors are bright and beautiful. The toy is sturdy and the finishing is just perfect. The toy primarily requires threading of all the flowers and leaves. Threading is a complex fine motor skill where coordination is required between both hands and eyes simultaneously. The child must be shown a few times how to perform this activity. The beauty of such toys is that there are multiple things you can do with them. You could teach pairing colors or shapes with this toy. A memory game can be deviced with this toy. Different pattern formation can be done, we made a few rangoli designs with these flowers. The activity helps in improving multiple muscle movements and dexterity. Cognitive skills- pairing helps in building short term memory and developing cognitive abilities. Visual discrimination- Pairing activity helps the children observe patterns and to classify them based on their physical properties. Creativity- Varied patterns can be drawn with just a few wooden flowers challenging and enhancing the creative abilities. Writing skills- Threading is a pre-writing activity, setting the base for writing. As the child moves the flower, the hand movements and tri-finger grip aid in writing skills. Since threading requires finer skills, the toy did not interest my son much (he is 19 months old right now), but he does enjoy playing with the flowers and the string individually, another advantage of open ended toys. 1. What I want him to achieve from these toys? 2. Will this enhance his motor skills? 3. How will it improve his cognitive abilities? 4. Is there scope of manipulation or open ended play? 5. What material is It? 6. Could it pose any hazard to my child? 7. How many more months will it possibly be useful for? 8. How long can my child be engaged with this toy at a stretch? 9. What is the complexity level? 10. And of course the price. Is it a value for money purchase? Skola toys are manufactured by a company that has pioneered preschool solutions in India and is a leader in making montessori materials. Each Skola toy is researched and crafted to provide the best learning outcomes for children. Check out their website for wonderful educational toys to choose from. Happy learning and happy playing!!! Thanks. . They have various age appropriate learning toys. Will surely tru it out when my daughter reaches this age .. had no clue about this toy but thanks to you that awarsness was created. Its seems best toy for toddlers to enhance their many different skills as you mentioned. Its seems very attractive and fun playing for kids. Will try this toy for my two and half yr son. Thats why i Just love the skola toys for their unique style of toys . Like your review too. Looks like a best toy option for kids . I love sokla learning toys collection. This is something which is totally new to us. Thanks Rashmi for introducing us to skola toys which looks really interesting :) would try it for Rishaan !! I haven't heard this before and it looks like a perfect toy for toddler. and it is great for the skill development for kids. Will definitely check this out. Skola comes up with such great concepts with toddlers and kids! I'm looking for learning toys for my 3yrs old kid. Will buy these. this looks like such a thoughtful toy !